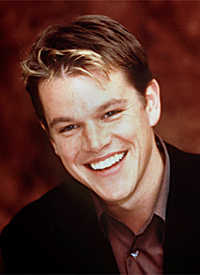 This page is fully dedicated to the talented actor Matt Damon! Click on the picture of Matt to go to a page full of upto date info on him. Currently seen with: Winona Ryder. At the moment Matt is "going out" with Winona. His best mate, Ben Affleck, is also "going out" with Gwyenth Palthow, who is in fact living with Winona. First feature film credit: Steamer in the 1988 movie 'Mystic Pizza'. E-mail me (by clicking the envelope) with comments or information. COMMENT: I HAVE NO ASSOCIATION WITH MATT DAMON! I AM JUST A FAN! This website has no association with Matt at all. He is no relation to me and I have no contact with him. Please don't leave messages in my guestbook for him.